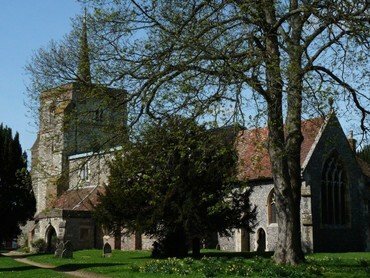 The Friends of St Leonard’s Flamstead is a charitable trust dedicated to preserving and maintaining the fabric of the ancient Grade I listed church that has stood at the heart of the village for nearly 900 years. The Friends were founded in 1999. Our aim is to raise funds to preserve the church building and its surroundings, not just for the benefit of church goers but for the community as a whole. Working alongside FoSL is Flamstead Heritage Group, a task force with a specific fixed-term goal of raising the huge sums required for the one-off repair of the roof and related activities. FoSL has a longer term remit but we are working closely with the Heritage Group to save St Leonard’s from closure. The church will have to close if the funds are not found and 900 years of our heritage will be lost forever. We are not involved in religious matters nor the day-to-day running or church activities, which are the responsibility of the clergy and the Parochial Church Council (PCC). The PCC has overall responsibility for the church building. The Friends have supported a variety of projects such as the restoration of the tower and the overhaul of the roof. 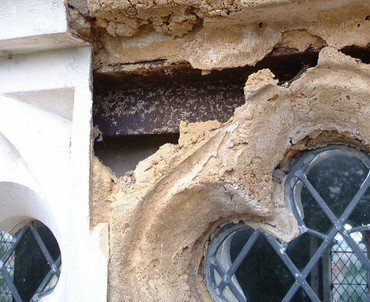 In the ten years from 2007 the Friends contributed nearly £100,000 to help fund repairs at St Leonard’s. Major grants have been made for the restoration of the north clerestory windows and adjoining walls totalling £87,000. Other Friends’ grants included £6,600 to pay for repairs to the copper covering of the nave roof, £3,500 for the repair of the south aisle roof and lead flashing and £1,000 towards repairs to the tower clock. The photo shows crumbling stonework deteriorating behind a 1960’s fibreglass facade. St Leonard’s is now on Historic England’s “Heritage at Risk” register and needs immediate care to ensure its survival. In 2018, the main current concern is the renewal of the nave roof. This will require a major fund raising effort and involve the assistance of outside grant making bodies. In 2017 the Friends committed £6,000 to the funding of the detailed survey of the roof recently carried out by the church’s architect and expert advisors. The south clerestory windows also require urgent attention. This is likely to cost around £120,000. Once the roof and the windows are fixed, and the climate inside the building is stabilised, work can begin on the long overdue preservation of the wall paintings. 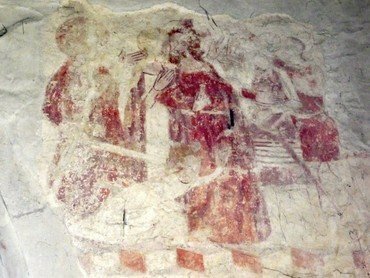 Damp has penetrated over the years and threatens the important 13th and 15th century wall paintings. These paintings can only be restored when the damp has been eliminated. Many other parts of the church also need restoration by specialist craftsmen. The sacristy, adjoining the chancel, has badly eroded stonework and rotted woodwork. The exterior stonework of many of the windows on the north side is badly eroded. You do not need to be a regular churchgoer or even a Christian to help. Many of our supporters only visit church at Christmas or for weddings; others are of different faiths or none. There are many ways you can help ensure that St Leonard’s and its churchyard survives for the benefit of future generations. Visit it the Support Us page for further details.